The passive crossover has a very important job in the component speaker system. It needs to divide the duties of precise musical reproduction to the appropriate speakers without introducing phase shifts or distortion into the music. The PodHP-LP is a high-pass crossovers specially designed for use with 2” Hybrid full range mid-tweeters and full range use of 3” mid-woofers in configurations where the 2” Hybrid mid-tweeter or a 3” mid-woofer is added as fill to an existing sound system. 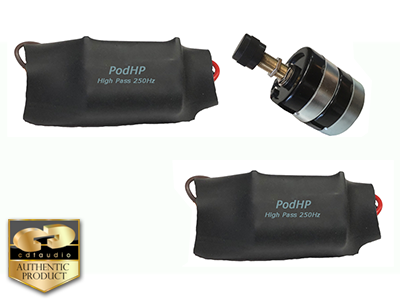 The PodHP-LP will give the 2” or 3” speaker full high power-handling along with existing sound system. The LP-1 stereo volume control unit in this crossover kit allows level setting in the tweeter/mid-woofer pair while maintaining the crossover response shape throughout the useable range. It allows a range from full on to minus 10dB. The crossover high-pass design allows the speakers used to play high-power from 250Hz to its natural roll-off frequency. The PCB is heat shrink wrapped for protection. Picture shows open PCB.